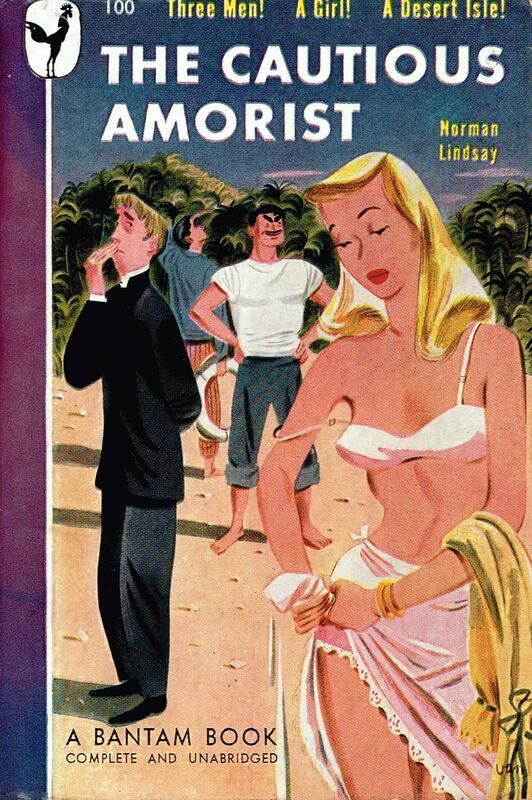 Norman Lindsay’s The Cautious Amorist was published in 1932, and released as a mass market paperback in 1947. It seems publishing cycles used to be much slower. The story begins with a shipwreck, and by the end of the first chapter, Miss Sadie Patch, Reverend Fletcher Gibble, journalist James Carrol, and stoker Patrick Plunket, all previously unknown to each other, are adrift in a lifeboat. After a few days, they wash up on the shores of an uncharted tropical island. Being stranded on a tropical island is a long running cartoon genre, the concept of Gilligan’s Island, the rationale behind choosing ten favourite books, and a popular setting for allegories of all kinds, from Robinson Crusoe to The Blue Lagoon (book). It’s also the setting for many a salacious tale, such as The Blue Lagoon (movie). The Cautious Amorist falls into the last category. The overall tone of the story is that of a well told dirty joke, with occasional forays into some of the less pleasant realities of the situation. Clothes are gradually shedded or shredded, but decorum is more or less maintained. Fish and fruit provide a reasonable diet, and after one bad food choice the castaways remain fit and healthy. I am reminded of a line from Star Trek: On encountering a healthy castaway, Dr. McCoy notes that after a few years on his own, he’d either be healthy or dead. The biggest problem on the island is surplus time, and sexual tension. The Reverend and journalist agree, in a rather classicist way, that they need to keep the stoker occupied so he does not take advantage of the lady, and jointly declare that it would be best for all concerned if none of them pursue her. In addition to being classicist, it should be no surprise the story is sexist. The woman and the stoker are always referred to by first name, by the characters and the narrator, while the journalist and the writer are referred to by last name. The narrator generally stays with the journalist, and from his point of view we learn the thoughts and feelings of the other men. We follow along as the journalist clumsily courts and beds Sadie, but neither he nor we know much about her feelings regarding this or anything else. From the men’s perspective, Sadie sometimes appears out of touch with the situation, and demanding in a “what a silly girl” kind of way. At other times she is the Victorian “angel in the house,” keeping the men productive and civil. However, the realities of being female occasionally intrude. One morning Sadie demands that one of the men hand over a shirt, on the understanding that it will be torn up and they will not get it back. The Reverend is confused, and notes “That’s very curious.” The journalist explains female biology (from his perspective, of course). Curious! Well you can call it that, I suppose. I call it a blasted nuisance; you can’t put your arm round a girl without being nagged at by its idiotic threat. It’s like everything else in the system; a nemesis all out of proportion to its rewards. Think of all the gallant little imbeciles of girls who are wondering at this moment whether last night’s embrace is going to be next month’s maternity. I’ve had a few bad times over that question myself, barring the blessed resources of a little antiseptic surgery. The ending is the punchline of the dirty joke, as we finally get Sadie’s view of the situation, and how she handled “you idiots.” Although it is just the punchline, Sadie is revealed to be the most resourceful and toughest of the group. Her story of surviving the island is more gritty and interesting than the comic antics of the men, and sobering, but the book isn’t about her, despite the title. It would be quite a different book if it were.